Love Takes A Stand is a personal and socio/political love jam. A New Musical Experience featuring theatrical-jazz-folk fusion with stylized narrative. Acute audience interplay. A World Premiere under the musical direction of renowned composer, conductor, and pianist Emilio Palame. 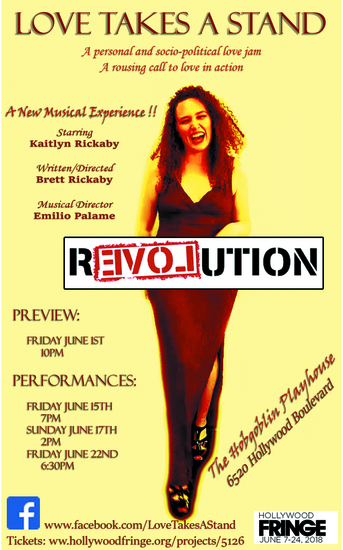 An auspicious entrance onto LA theatre scene by female lead Kaitlyn Rickaby, her three-piece band (piano, stand up bass, and trumpet) and back-up singers. Written and directed by veteran actor and writer Brett Rickaby. Love Takes A Stand is a rousing call to love in action!